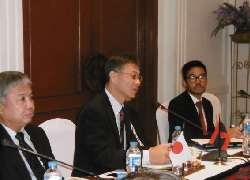 Under the instruction and financial support of the Ministry of Economy, Trade and Industry (METI), the Energy Conservation Center, Japan (ECCJ) implemented the first dispatch of experts in the current fiscal year to Cambodia and Lao PDR to support the preparation of energy conservation laws and related systems for the purpose of promoting energy conservation in both countries on the following themes in August 2018 and October 2018. (1) Confirmation of the progress in the approval process of the energy conservation policies and the energy conservation Prime Ministerial Decrees that were drafted in FY2017. 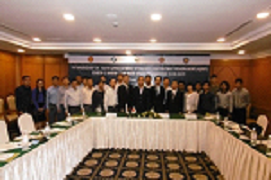 The Workshop was attended by around 25 participants from institutions including the Ministry of Energy and Mines (MEM) as the ministry in charge of energy conservation, the Ministry of Industry and Commerce, Ministry of Science and Technology, Ministry of Finance, Électricité Du Laos, Lao PDR Demand Side Management and Energy Efficiency Project, National University of Laos, Air Conditioning Association, and the ASEAN Centre for Energy, and lively exchanges of information and discussions were developed relating to the themes described below. ○ The Energy Conservation Prime Ministerial Decree has been examined by the Prime Minister’s Office and the Ministry of Justice, and it is aimed to gain approval within FY2018. ○ Regarding the S&L system preparation, enthusiastic discussions were held in the technical working groups concerning the utilization of the CSPF as an evaluation index to be applied to both the inverter and non-inverter types, the five-stage standard levels of the rating table, and the contents of the energy labels. Items including the adoption of the CSPF as the inverter evaluation index, the revision to realize a rating table that recognizes the harmonization within the ASEAN region, and the improvement to realize label descriptions which can be easily understood by consumers were determined. 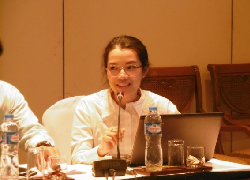 ○ In preparation for the discussions on preparing energy management systems, the Ministry of Energy and Mines (MEM) implemented actual energy consumption surveys and analyses of around 70 buildings and factories in Vientiane and provided the information at this Workshop. Referencing the analyses results and the examples from various other countries provided by ECCJ, the proposed stipulated standards (draft thresholds) for business operators subject to energy management were formulated. In addition, enthusiastic discussions were also held relating to the building of systems for promoting energy management system preparation including the formulation of model projects by industry, government and academia. 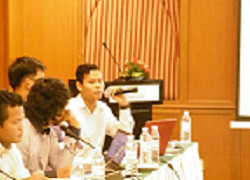 The Workshop this time was attended by around 25 participants from institutions including the Ministry of Mines and Energy (MME), Institute of Standards of Cambodia (ISC), Ministry of Economy and Finance, Ministry of Land Management, Urban Planning & Construction, Ministry of Environment, Electricité du Cambodge (EDC), Institute of Technology of Cambodia, Royal University of Phnom Penh, and the ASEAN Centre for Energy, and lively exchanges of information and discussions were developed relating to the themes described below. ○After the government advisory council had confirmed the contents of the proposed energy conservation policy(NEEP:National Energy Efficiency Plan), it was submitted to the Prime Minister, aiming to gain approval in December 2018. ○ Regarding the S&L system preparation, lively discussions were held in the technical working groups including the MME with regard to improvements of the proposal developed in the previous fiscal year based on the approach of setting the standards of the Japan Refrigeration and Air Conditioning Industry Association (JRAIA), the trends of standards adoption in ASEAN and the world, and the Cambodian market situation. As a result, it was determined to adopt a rating table that will be applied to both inverter and non-inverter types (adopting the CSPF), and to improve the contents of energy labels. 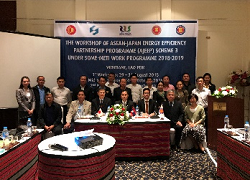 In addition, as support provided by ASEAN countries, the Malaysian Energy Commission participated in the activities and provided the Cambodian participants with beneficial information regarding the preparation items and issues for operating S&L systems. ○ Regarding energy management systems, intensive discussions were held concerning the approach of setting designation standards, namely the tentative threshold for business operators. For formulation of the tentative thresholds, it was confirmed that further investigations would be required with regard to actual energy consumption at buildings and factories. 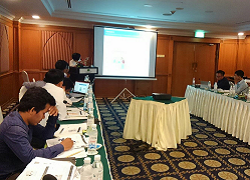 As described above, system preparation is steadily progressing both in Lao PDR and in Cambodia. The items to be implemented to realize the current fiscal year targets were clarified, and the future action plans were formulated.